Whether in the pool or far out at sea, knowing how to swim can save a life. According to the Centers for Disease Control and Prevention, 3,443 people unintentionally drowned in the U.S. in 2007. An additional 434 people died from boating-related drowning incidents. Swimming aids include flotation-type devices that can help you learn how to swim and may also be used for regular fitness. Swim boards are devices that float in water, though some offer adjustable buoyancy. Also known as kickboards, swim boards are ideal for beginner swimmers because they help keep the swimmer afloat while they master certain skills such as kicking. Some swim boards also come with molded handlebars throughout the board, which makes it easier to hold on to. A swim board is also useful as a fitness training device. Use a swim board to kick your way across the pool or for aquatic workouts to develop your leg muscles. Made out of brightly colored polyethylene foam, noodles resemble their namesake -- long, thick noodles. Used as a swimming aid to teach swimmers how to swim and float, noodles can also be used as an exercise or rehab tool, a rescue device, and a snorkeling training device as well as a fun toy in the pool. Available in a variety of colors and sizes, most noodles are capable of withstanding between 100 and 300 lbs. 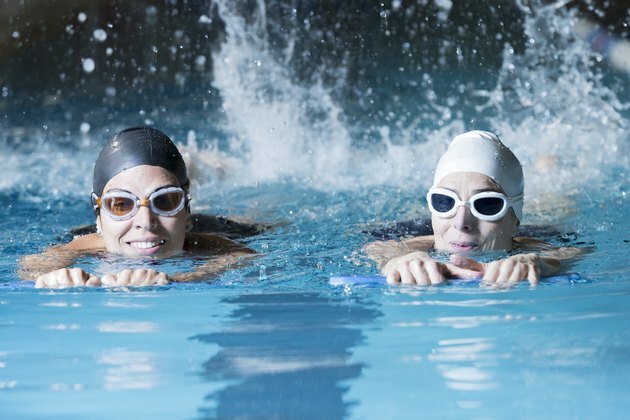 Not to be confused with a life jacket, swim jackets and vests are swimming aids that help teach adults how to swim as well as aid those who need additional support during water physical therapy. Made out of durable materials, a swim jacket/vest might feature a form-fitting design, an adjustable crotch strap to keep the jacket from floating up and floats that can be removed as the swimmer gains experience. This device should not be used as a life jacket because it doesn't provide the amount of buoyancy needed to keep you afloat for long periods of time. Learn how to float, as well as improve your swimming technique, with a swim belt. This device features a strap that snaps around your waist and features between two to four blocks made out of foam. The foam blocks provide buoyancy and stability and may be removed as swimming and fitness levels increase. It might also be used during water aerobics.